This access point combines wireless and wired access in a single compact device. It’s ideal for hotels, medical clinics, classrooms, branch offices and remote workstations which often require flexible and easy deployment options. Three local Gigabit Ethernet ports are available to securely attach wired devices to your network. One of these ports is also capable of supplying PoE power to the attached device. 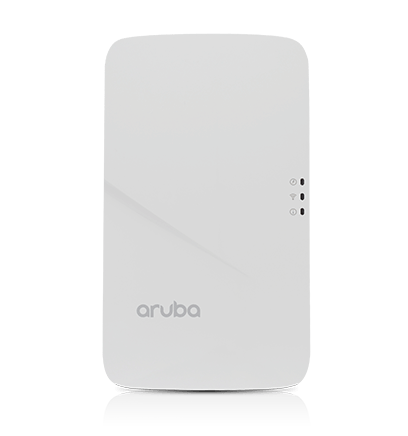 Integrated Bluetooth Aruba Beacon simplifies the remote management of a large-scale network of battery-powered BLE Aruba Beacons while also providing advanced location and indoor wayfinding, and proximity-based push notification capabilities. The AP-303H can be deployed as a wall-mounted hospitality AP or converted to a desk mounted remote AP. Two integrated dual-band moderately directional antennas for 2x2 MIMO with maximum individual antenna gain of 4.3dBi in 2.4GHz and 6.2dBi in 5GHz. Built-in antennas are optimized for vertical orientation of the AP. The horizontal beamwidth is roughly 120 degrees. Combining the patterns of each of the antennas of the MIMO radios, the peak gain of the effective per-antenna pattern is 3.2dBi in 2.4GHz and 4.6dBi in 5GHz. Unrestricted functionality with direct DC power. When using an 802.3af PoE source, the PoE out (PSE) capability of the 303H is always disabled. Without IPM, both the USB port and PoE out (PSE) capability are disabled when the AP is powered by an 802.3af PoE source, and either the USB port or the PoE out (PSE) capability is disabled when powered by an 802.3at PoE source (PSE capability is disabled by default). The AP ships with a mounting plate to attach the AP to a single-gang wall-box (most international variations covered). A security screw (T8H) is provided to ensure that the AP cannot (easily) be removed from its mount without a specialized tool.